Aromas of pear and quince flow through to a rich dry palate. Dense and exotic aromas of apricot, musk and rose. Finer nuances of cardamom, cumin and orange blossom all add to the complex tapestry of this wine. Without interruption, the aromas flow through onto the palate adding yet more layers and interest. Poached stone fruit, cinnamon, and star anise along with a crystallized ginger note are a few of the many fruit and spice notes to be found. Full and rich this wine is best enjoyed on its own or with spicy Asian cuisines. This wine is predominantly a blend of clone 1106 and 456 Gewürztraminer. The very ripe fruit was harvested in early April with a small component of Clone 456 left to hang out until late April. This late pick was fermented in barrel with wild yeast. All tank portions were inoculated and fermented to nearly dry. After settling, the tanks were racked and allowed to develop without sulphur for 10 months prior to blending and bottling. 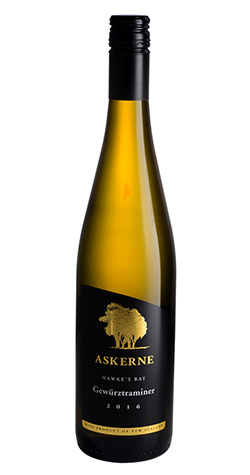 The Askerne Estate Winery vineyard site comprises six different soils varying between river gravels, sandy soils, silt, and loams. The subsoils vary from gravels, red-metal, and clay. These various soils have been matched to particular varieties and also to produce complexity within varietal styles. The site also has unique climatic attributes. It is forward of both the Haumoana hills and Havelock North hills and is close to the coast, benefiting from the moderating effect of the sea. It is a plains site receiving cooling winds from all directions including draughts from the adjoining Tuki Tuki river which laid down the various soils. These cooling effects are key contributors to the elegance and aromatics of our white wines. The soils and climate provide a base, which is built on by a variety of clones and rootstocks within each variety to add further complexity. Our viticultural management reflects a meticulous approach to our philosophy that fine wine is made in the vineyard.